Mom bloggers who are selling services should building a formal sales funnel, which builds the most solid online business possible. A sales funnel works by attracting potential customers with free or very-low-cost items, and then convincing these potential customers to sign up on your mailing list or subscribe to your RSS feed. When you have their contact information, you can start to build a relationship with them, ensuring that when they’re ready to make a purchase, they come to you. Offering your potential customers a range of products at different prices helps build up their trust, eventually making it easier for them to invest in your higher-priced items or services. If you normally earn your income by charging by the hour or by the project, a sales funnel also serves to create diversity in how you bring in your income. That protects you against putting too many eggs in one basket. 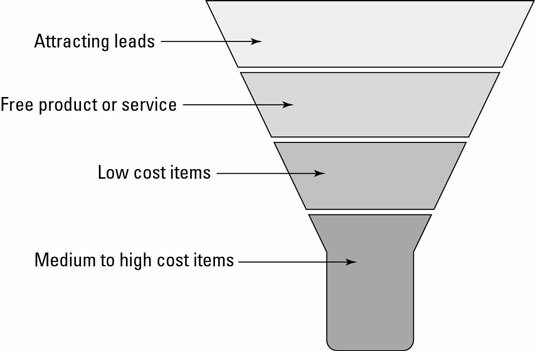 See how the sales funnel works: You have your largest number of potential customers on your mailing list, and gradually smaller numbers of actual customers as the price of your services increases. Post blog entries that offer free advice. Get mentioned in the press. Meet potential clients on Facebook and Twitter. Ensure your content can be found in search engines. Publish articles on other websites.